Last week I did a post about questions I had been asking myself while watching the Olympics. As the Vancouver games draw to a close, you'll be happy to know I found answers to some of them. Q: Will making jokes about curling ever get old? A: Yes. Curling jokes immediately became tired and stale when Jay Leno attempted to lampoon the sport in a promo for his return to the Tonight Show next week. Q: Is there really a difference between pairs figure skating and ice dancing? A: Pairs figure skating involves more pumping up the jam. Q: Who invited Jeff Bridges to be in the "We Are The World" remake? A: I still don't know, but I wish he would have gone Obadiah nuts at the end of the song. "This sounds like it was recorded in a cave... with a box of scraps!" 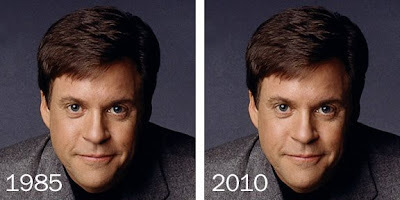 Q: Does Bob Costas age? A: The answer became clear when I did this side-by-side comparison. Q: Aren't the snowboard events just an excuse for Team USA to win more medals? A: Not if Lindsay Jacobellis is involved. Q: Is it less heterosexual to be a male figure skater, or to be a male who watches figure skating? A: I'd take either of these options over two man luge. Q: If I eat my McNuggets and drink my Coca-Cola, can I become an Olympian too? "I find I'm so excited, I can barely sit still or hold a thought in my head. I think it's the excitement only an Olympian can feel, an athlete at the start of a long journey whose conclusion is uncertain. I hope I can do my best and win the gold. I hope I can make my country proud. I hope this Coke washes away the aftertaste of these McNuggets. I hope." So long, Olympics. See you in London in 2012. I was all excited to watch Chris Farley but it didn't work for me.. Always a little sad to see the Olympics come to an end. Is anything more tailor made for YouTube than old SNL clips like this? Darn NBC and their copyright claims. Love this post! Whole heartedly agree about two man luge. What the...? Pump up the jam they will. Oh yeah. Jeff Bridges was bad enough... but Vince Vaughn?